Discussion in 'Star Citizen' started by Horace, Feb 8, 2019. The first Persistent Universe monthly report of the year details all the work done by the Star Citizen team throughout December and January. While the devs and studio teams took a break for the holidays, the early winter months saw a ton of tasks completed, progress made, and new ideas seeded. The AI Team put effort into stability and optimization for the recent alpha releases and patches. AI gunships gained new tactical options, including the introduction of a new behavior that allows them to circle enemies and use their turrets to attack from a constant distance. Designers can easily modify this behavior to change things like the optimal attack range and when to disengage the target. The ‘fly-by’ and ‘breakaway’ tactics were also amended to make better use of the predicted hit position and allow ships to better evaluate the environment to determine the optimal direction for evasion. An ongoing focus for the team is converting all new movement logics to utilize the new Intelligent Flight Control System in preparation for its upcoming release. For human combat, the team worked to improve the behaviors released in Alpha 3.4, making sure basic structures were in place to enable AI to decide which cover location to use, when to shoot, and when to relocate. The cover selection has been expanded to order the query based on the amount of protection it gives when multiple targets are taken into account. They also implemented an improved way to debug behaviors and can now visualize the debug tree on multiple characters at the same time as well as use the Subsumption debug draw in a server/client environment. Time was spent on the perception system, which was expanded to handle damage stimuli; AI characters now have proper awareness of damage, so they know the exact location of the source and will behave accordingly, tracking if a specific enemy they lost sight of is the source of damage and updating the knowledge they have about them. Progress was made on the Usable Builder, which allows the team to easily visualize usables, edit their properties, and test the different use channels. For the mission system, they exposed several new functionalities to the designers, such as a variety of task nodes, new variable types, and new core functionalities. A ‘group’ variable was introduced that can automatically be filled up when spawning AI characters to let designers track the dynamic elements they’re interested in. Currently, the AI Team is implementing global callbacks to help the designers track environmental events specific to the data they’re interested in without the need to explicitly create variables for each entity. The PU Animation Team spent the pre-holiday period finalizing mission givers, including Constantine Hurston and Tecia Pacheco, and are currently working on ship dealers to give players a salesman-like experience when buying vehicles in-game. They’re also continuing to actualize the emotes shot at CitizenCon. The team worked hard to improve the ship audio experience in-line with the new flight model, which included implementing improvements to thrusters, powerplants, and the overall sound mix. They’re also integrating greater levels of complexity via new components, including ship vibration and environmental feedback variants, that deliver greater feedback from turbulence, impact, and atmospheric flight. Physicalized props and physical objects received audio support recently to ensure they have appropriate impact, role, slide, and topple sound effects. A recent addition to this is the team’s work on implied contents for carriable items, such as crates. The Foley system is continually being iterated on, with the team improving the footstep and cloth systems in relation to various contexts, e.g. material/surface types and pressurized/unpressurized environments. The sounds will all vary for the upcoming female player character, too. Working closely with the PU music composer, Pedro Camacho, the team has been laying the groundwork for various upcoming locations, including ArcCorp and Area 18. This includes creative conversations with the Narrative, Art, and the wider Audio Team to establish appropriate sound pallets, instrumentation, styles, and motifs. The Audio Code Team drove significant progress on the new CIG Audio System, which will hugely improve the audio implementation pipelines and consolidate functionality into a single tool with much wider scope and flexibility. In other news, the Audio Department is hiring! They are looking to fill two sound design and one dialog specialist positions. This is in line with the team’s planned expansion and all talented audio professionals are encouraged to apply. Backend Services completed a large portion of the foundation work for the new diffusion backend architecture. This includes the continued break-up of the general instance manager into smaller scalable services. The dedicated game server needs to communicate properly with the new services, so hooks and proper calls have been set up between them. Support was also given to the Alpha 3.4 release and subsequent smaller releases to ensure communication on the backend was as efficient as possible. Plans were laid out in January for the new diffusion network and work was done to ensure the services scripting language continues to function efficiently. Finally for Backend Services, a handful of alterations were made to the various new services and existing databases for increased efficiency. Character Art brought the Shipjacker Armor to players along with the holiday-themed Shipjacker skull helmet. They also set out to unify all armors and undersuits for female playable characters and finalized the concept for mission-giver Tecia ‘Twitch’ Pacheco. After a nice holiday break, the team started on tasks for the upcoming DNA feature. For this, the team needed to convert, mark-up, and unify all head assets to work with the male and female protos, including the unification of all Data Forge assets. DNA is a major feature that affects the entire facial setup and pipeline for characters in Star Citizen. This significant feature touches a lot of teams, and through a lot of dedicated collaborative work, is progressing very well. The teams are currently updating mesh formats to support the data sets required, wrapping up and fixing any bugs relating to GPU skinning, and updating all the attachments in the game with the mark-up required for DNA compatibility. The system has begun to roll out in the PU on NPC characters and is already yielding performance wins. Lots of cooperation and iteration between all DNA teams has resulted in a fun and intuitive interface that allows the player to easily create their own face for their player character. The DNA feature is on track to meet its scheduled release. Finally, The team is also concepting new mission givers and outfits to bring more life to the Persistent Universe. The Community Team held two holiday-themed competitions: One invited Citizens to create greetings cards to express their love and gratitude and wish each other happy holidays. The other put the festive helmet and cargo to good use by asking everyone to show how they celebrate the holidays in the ‘verse. The new Star Citizen Fankit was released that offers a wealth of free assets along with a style guide to help content creators use them at their best. Looking for wallpapers, manufacturer logos, music, and more? Download the kit and check out the FAQ answering all the questions about what a content creator can and can’t do with official Star Citizen assets. 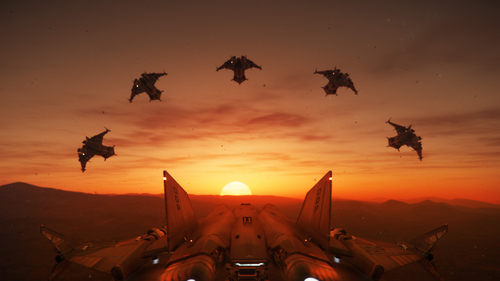 In January, the team celebrated Australia Day with a screenshot contest that had everyone showing off their best flight formations in the Gladius Valiant (which was made available to all backers for the occasion). They also kicked off another contest highlighting Tumbril’s rough and rugged Cyclone series that challenged content creators to take their filmmaking skills off-road. A few of the Community Team members spent a weekend exploring PAX South and attended the annual Bar Citizen event on the River Walk. Selfies were taken, stories shared, and friendships made. Have you checked out your hangar lately? The ‘One Empire Anniversary Coin’ was distributed to all backers who pledged before to the $200 million milestone. Lastly, the Daymar Rally took place on January 27th, with three different divisions (Rover, Buggy, and Bike) battling it out for glory and rewards. Everyone involved should feel very proud of themselves, as seeing the filthiest race in the ‘verse come together was an incredible experience for everyone. Well done! The Economy Features Team focused on adding new weapons to the various shops around the ‘verse. Once complete, shop inventories were set up for all the new locations and various bugs were squashed. Tweaks to missions and the overall economy were also made to move the game closer to the end economic goals of the team. In January, testing began on a new formula that dynamically alters certain commodity parameters within the wider economy. A new approach is also being taken towards vehicle components to help create interesting choices for players when in shops – even if they have enough money to buy anything they want. Polish was added to various NPCs throughout the ‘verse, with the aim to make them as realistic and believable as possible. The design was complete for a new nav marker ruleset that makes how and when players see destination markers more intuitive. Rulesets were also created to add functionality to the Quantum Travel and Service Beacon systems to give players more options when traveling in a party and choosing a location for service beacon transport respectively. DevOps broke their previous record of the number of internal builds published to the PTU and live service. 2018 was the first year that scaling automation was used on the live service, which allows the servers to keep up with demand when needed but cut back as necessary. The new system exceeded all expectations and led to one of the smoothest holiday seasons ever. Build Operations was hard at work developing new systems to support a major pipeline upgrade to the overall game development process and continues to build new systems and improve on old ones. The Engine Team supported the Alpha 3.4 release and subsequent patches with general assistance, profiling, optimization, and bug fixes. For compute skinning, they made tangent reconstruction optimizations for character faces, data optimizations and compression to lower bandwidth requirements, separated static and dynamic GPU data, and moved bone-remapping to the GPU (to save CPU memory and provide more flexibility). Work began on HDR color grading and output on supported displays, while splat map support for planet terrain was added, as was an improved film grain with unified dithering. The development of planetary ground fog began along with significant improvements to temporal sample anti-aliasing (TSAA). The physics engineers enabled joint limits on driven ragdolls and fixed instability caused by a threshold in the solver. They also made the first steps in exposing the spatial grid structure for walking and exploring and added physics support for planetary oceans. Improvements were made to crash handling, including various thread-safety improvements to enable more robust handling of obscure crashes, and the addition of extra information into minidumps to allow for better debugging of fibres. Winter saw work begin on the Environment Art Team’s next big target: microTech and its landing zone, New Babbage. In preparation, designs were trialled for the ‘Hi-Tech’ common elements, which include habs, garages, and hangars in an all-new architectural style. These new sets will help the team build New Babbage and ensure the visual style feels fresh and different. Recent improvements to the organics shaders and pipeline will improve the look of geology and planets. This update has been a long time in the making and the team is looking forward to giving all planet assets a visual upgrade. The team is currently moving from whitebox towards release for both the planet ArcCorp and its main landing zone, Area 18. Some necessary changes have been made to Area 18’s original layout, mainly for performance reasons but also to improve the general layout and city ‘feel’. Like many others, the Gameplay Feature Team put in a concentrated effort to fix as many bugs as possible for the Alpha 3.4 release. Specifically, they overcame issues with FoIP & VoIP, Comms, and the Group System. They also supported the US Vehicle Feature Team with their UI-needs for item sub-targeting and the ongoing turret improvements. The team kicked off 2019 supporting patches for Alpha 3.4.0 before moving straight into feature work for 3.5, including the UI for DNA face customization, continued improvements to Comms video streaming, and a refactor of shop population. The performance gains mainly came from improvements to shadow culling and optimization to video comms, especially on lower-spec machines (though there are some quality issues still to address). The largest memory saving came from fixing a particularly nasty bug in the mesh streaming code which could result in all levels-of-detail loading for a mesh rather than just the ones needed. Other savings came from increasing the sharing textures used by various effects and improvements to the logic in which textures should be streamed in (interestingly, the game can now run with as little as 400mb of textures!). On top of this, the team resurrected the water volume tech and made it compatible with the zone system so it can be used on planets, space stations, and ships. Level Design finished the current iteration of Lorville’s Central Business District (CBD) and added it to the city. They are now looking into the trainlines that connect it to Teasa spaceport. However, the majority of the team is currently focussing on ArcCorp and Area18, with the hangar, shop, vendor, spaceport, and overall layout now finalized. They also gave the planet and its moons a necessary design setup, began an investigation into quantum traveling AI, and introduced a variety of new narcotics during the prototyping of a new mission from ‘Twitch’ Pacheco. The Lighting Team focused on finishing the CBD and supported the addition of mission-giver Klim to Levski for the Alpha 3.4.0 release. They also looked at the small and medium-sized common elements for the player hangars and created different lighting variations for the Rest Stop, Lorville, and upcoming Area 18 styles. They’re currently fleshing out the development tools by creating an asset zoo for all current ‘utilitarian-style’ lighting fixtures in use throughout the PU to help them quickly and efficiently add lighting to new locations. The Narrative Team returned from the holidays to tackle the Alpha 3.5 update, including developing ideas for the branding of street and food stalls in Area 18 and outlining the NPC archetypes needed to populate the city and mission content. The team is also excited to welcome a new producer to the group; not only will he help keep the team organized, he’ll act as the point of contact for the other teams to make requests through. Player Relations busily wrapped up the Alpha 3.4 publishes along with all of the work created over the holiday period. They teamed up with the Evocati for several builds to make sure everything was properly tested and completed several rounds of PTU publishing and testing. Progress was also made on an internal quality-of-life feedback report that comes straight from backers’ experiences. Planning has already begun for the upcoming Alpha 3.5 release – particularly the testing of the new flight model. From the small dressing items on Constantine’s desk to the giant Hurston statue, Props mainly spent December finishing up Lorville’s CBD. New mission props were created that focused on the illegal drug trade and surface relay kit. Finally, for December, ideas were floated for cockpit flair and work began on ship sub-items. In January, some of the team moved onto looking at the ship items themselves, initially taking stock of where they’re up to and looking at how they can integrate sub-items into interiors. The majority of the team have now shifted onto the new Area 18 landing zone and are looking into white-boxing props and supplying basic block outs so other teams can start to build and dress the level. QA tackled some of the more difficult-to-reproduce issues in the run-up to the Alpha 3.4 release. Dedicated feature testers for both AI and the Gameplay Feature Teams continued to test their respective areas (combat AI, ship AI, non-combat AI, and transit system) via sanity and smoke tests along with standard testing and regression. QA now provide dedicated support to the Locations Team to ensure that current and new locations are set up and working as expected by Art and Design. A few notable requests involved testing fixes for server deadlock and various changes to the physics of jumping and going down stairs. Changes to the Entity IDs in Track View were tested in the editor to make sure they were seamless and bug-free. A new restricted area for ground vehicles was also added to Lorville, which was thoroughly tested by both the German and UK teams. Further investigation was made into the issue of Ship AI idling during mercenary and Emergency Communication Network (ECN) missions to ascertain whether it was AI or network related. The team could only reproduce it during ship AI missions in the live environment and encountered something close to it during a 20-player playtest. The one consistent factor was that it only seemed to occur when performance took a dip. So, it was deemed not an AI issue and will be further investigated by the Network Team. On the publishing side, QA tested the Alpha 3.4 builds before they reached the Evocati and Live service. In January, they worked through the 3.4.# fixes. Recently, attention turned to preparing for Alpha 3.5. The holiday period saw four new testers join the extended QA family, too. The UK Ship Team continued developments of the Origin 890 Jump, with further greybox work done on the atrium, master suite, guest suites, and engineering deck. They also refined the exterior hull styling to try and move a few areas closer to the original concept and make the overall ship less ‘cartoon-looking’. Everyone’s favorite pathfinder, the Anvil Carrack, has progressed since it was last seen. It’s currently in greybox, with the team tackling the feedback generated from the discussions on RTV, particularly the controversial landing gear changes and bridge layout. Finally, the team made steady progress with the updates to the Aegis Vanguard in preparation for the Harbinger and Sentinel, with focus primarily on interior adjustments along with some quality-of-life fixes for those aboard. Greybox is progressing nicely, so the team will be moving onto the exterior and tackling feedback points to ensure the base Warden model is properly prepared to accommodate the variants. Ship Art is currently hard at work to bring the new 300i series to life. They’re in the process of getting the damage and customization pass complete, finishing up detail work on various parts, and finalizing the materials. Alongside the 300i, they’re chugging away on the Defender; the first in-game asset from the mysterious Banu alien race. Extra care was taken to ensure the Defender represents the overall Banu design aesthetic and can be built on in the future. The exterior is currently going through the greybox modeling process and is nearly complete. Afterwards, it moves to interior greybox modeling. The System Design Team investigated how to improve the FPS AI experience and social AI was introduced to the Lorville CBD. Gunships piloted by AI now circle their targets and orient themselves to maximize their firepower, while fighter AI was updated to take full advantage of the new flight model. Tech Art made steps to finalize the implementation and pipeline of the new facial customization tech, which was previewed at CitizenCon 2018. They switched the system’s source data format from the CDF-based system (which was used during R&D) to the newer component-based loadout currently used throughout the game. This system allows players’ customized faces to be stored persistently in the database and the corresponding data packets to transfer efficiently over the network and be applied to the correct avatar at runtime. Likewise, it allows all key NPCs (every shopkeeper, security guard, civilian, and eventually mission giver) to have a unique face built internally by the designers. While R&D on the DNA system was done using male faces, the face pool for female characters is being populated and is planned to come online at the same time. Tech Art also supported the Weapons Team with animation debugging, weapon rigging, in-engine setup, and debugging multiple render and resource compiler issues. They added a new system for weapons in Maya to allow animators to quickly attach different attachments, making it easier for them to author specific animations. They also updated the underlying metasystem in the weapon rigs to enable animators to export weapons without double transforms on the root or magazine controls. Turbulent supported the release of the 2018 holiday promotion, featuring a new giftable pledge called ‘For Your Friends’. This new pledge allows a customizable message to be sent along with the gift, making it ideal for friends and family. The holiday promotion also featured screenshot and greeting card contests. The team supported the availability of the Alpha 3.4 flyable ships on the website, including the Anvil Hawk, Origin 600i Touring, MISC Freelancer series, and the MISC Reliant Kore. The Cloud Imperium Games corporate website was released in December. Its slick new look is a much better representation of the company’s values and mission and properly communicates the vision behind Star Citizen. The ‘Join Us’ section has details of each location and over 100 job postings across 9 different categories, so see if there’s something to suit you at your nearest studio! Updates are continually being made to the latest news and job postings sections. Long overdue, the website navigation was improved with a new and improved platform bar and footer. Additional efforts went into creating the bar as a component to make future updates to the site easier. The Starmap is now accessible via the Apps menu to make it easier to find too! There were major updates to the Squadron 42 Roadmap, which is now tied into the internal project management tool, Jira. A new chapter design was introduced, showing the development progress as phases and chapters, while descriptions for each expose the details of what it actually takes to build the game. Turbulent supported the release of the Gladius Valiant Free-Fly promotion in celebration of Australia Day. A screenshot contest was available with prizes to be won. A customizable preference feature was added to the Group, Lobby, and Voice services to allow custom properties to be set for each user with each respective entity. The Voice service can start a call within a channel, inviting all those allowed to join. The new mobiGlas service will allow single endpoints that will appropriately gather the information from the Group, Lobby, and Voice service with a single call. Options can be passed that will select the type of information returned. The error catching software, Sentry, has also been added to each service to allow previously-uncaught errors to be tracked and reported to the appropriate Sentry project. During December and January, UI supported the Environment Team with in-fiction advertisements and branding for ArcCorp. They implemented new features on the tech-side to enable the designers to create ‘user variables’, which are used internally but can still persist on the entity the UI is bound to. For example, a designer may want to capture game-data values and store them internally within the UI to gain reference to previous values when the data changes. This functionality fulfills certain presentational needs that contribute to improving the user-experience. Another interesting implication is that, because they are sent across the network, they open up the potential for players to see each other’s UI state (what app they’re currently on, which particular item in a list they’ve highlighted, etc.). The team also implemented a new node allowing the ability to set up switch logic on a variable (as well as a widget) to dynamically load images on the fly. Together, these features enable the designers to build out a fully-functioning in-world weapon UI screen with an ammo counter, charge levels, and fire mode states. To help ensure that Alpha 3.4 was released in December, the team spent a lot of time supporting the release (and subsequent patches) by fixing bugs, including turret, vehicle, and crash problems. The team also completed modifications to the vehicle targeting system so that external items, such as ship engines, can be specifically targeted. Improvements to ship combat systems continued via automated gimbals, HUD changes to support Ping & Scanning, and the vehicle ‘XML to DataForge’ migration began. Wrapping up January, a vehicle gimbal aim-assist feature is on its way to completion. The Vehicle Content Team’s 2018 wrapped up with the launch of the Anvil Hawk and improvements to the Reliant Kore, which entailed a rework of the cargo section, ramp, and landing gear. A number of vehicle bugs were also fixed for the 3.4 release. Additionally, the team worked on the three Reliant variants for Alpha 3.5, while the designers have been working with the ship artists in Austin on the Origin 300 series rework. For much of December, the VFX Team focused heavily on polish and optimization for the Alpha 3.4 release. In particular, significant effort was put into making sure Hurston and Lorville’s environmental effects were optimized while remaining as high-quality as possible. In early January, they re-evaluated their sprint planning practices and implemented some simple production-led changes to improve overall workflow. Following on from that, they began R&D work on the Tachyon cannon; a weapon type with faster-than-light projectiles. They began implementing thruster damage effects in keeping with the new flight model planned for Alpha 3.5 and began R&D on how to use particle effects to help make Area 18’s volumetrics more visually interesting. They also worked on effects for the new Kahix rocket launcher – a handheld anti-vehicle rocket launcher with a unique tech style. New tools were created within Houdini to help design various assets. This includes a new, more accurate way to generate signed distance fields (SDF) on the surface of the gas cloud. These SDFs are used as an arbitrary surface that enable the ability to spawn and manipulate effects with, such as lightning crawling along the surface. The Weapon Art Team worked on the Multi-Tool rework, Kastak Arms Ravager-212, and the level two and three upgrades for the Hurston Dynamics Laser Repeaters. They also made minor adjustments to the iron sights on a handful of weapons to improve the sight picture and to make them more user-friendly when no optics are attached.